Do you know why I have always thought that there is something magical about the food? Simply, food means fun. In my opinion, without food, fun can’t be completed. My husband and I enjoy spending time with neighbors in our backyard. Nice weather, casual talk, laugh and bottle of wine… you know the occasion. We relish these occasions. Just one thing is missing - delicious food. In such situations, no one wants to go inside and cook in the kitchen. Ordering fast food isn’t always the best option. Not anymore! I found the perfect solution - the electrical skillet. With it, all obstacles for perfect enjoyment with our friends are gone. What Are The Advantages of Electrical Skillet? Which Electrical Skillet Should You Buy? Unlike regular skillets, electrical ones have its own heating source. It means that you don't need to have a stove in order to use them. Everything that is needed is an electrical outlet. Usually, electrical pans are made of aluminum. However, there are also types made of ﻿﻿stainless﻿ steel which should last longer, but they are more expensive. Here is a more detailed comparison between these two materials. All of them possess the heating element. Some of them have an option for detaching the heating element, and some of them lack it. Just notice that detaching option could be very useful since it makes washing much easier. The majority of electrical pans include a non-sticking surface on the interior and a glass lid which allows you to monitor the cooking process. Electrical skillets could be a multifunctional cooking tool. First, just as regular skillets, electrical ones are ideal for sautéing and frying. So you can easily use them for making scrambled eggs and pancakes or sautéing vegetables or mushrooms. But that is not all. Some better types could be suitable for preparing a roast beef, for grilling, or even for baking. Have you ever made lasagna in your backyard? I do it all the time since my neighbors love it. Second, the electrical skillet could be used as main cooking tool replacing regular stove, or it can be a splendid addition to it. For example, in the former case, it is ideal for persons who don’t cook too often or quantitatively much. On the other hand, when you don’t want to make big meals there is no need for turning the stove on and spending that much energy. The electrical pan could be reasonably good substitution as it is generally more economical than the stove. Personally, I used it almost every day for my husband and me while our boys were on holiday last summer. Third, the electrical skillet could be used for other purposes then cooking as well. You can use it as heated serving dish as it can keep food warm. This is especially helpful when you are expecting guests who are late. Finally, the electrical skillet might be helpful for outdoor cooking as well. You can transport some food in it or use it as the substitution for the grill if it isn’t working or you don’t want to fire it up. Just make sure that there is an electric outlet. The good ones should provide very even heating which is not always the case with the regular skillet. This means that there aren’t hot spots, but that whole skillet surface would have the same temperature. Because of that, food will be cooked evenly and more quickly. And if you use the lid as well, your dish should be finished even more quickly since all the heat will be kept inside the skillet. Of course, this depends on their dimensions but anyway they are certainly smaller than regular stoves. While you are using the electrical skillet, you can place it wherever it is good for you. Once you finished with cooking, you can easily disassemble it, pack all the pieces together and store them away in a fairly small space. Although you can find very expensive ones (up to $400), you don’t need to spend that much to get a decent electrical skillet. There are excellent electrical pans in the $30-40 price range. They are good enough to last several years, depending on how often you would use them. So the value for the money is there for sure. They are very durable, and reliable – my hubby used it quite often in the yard when he had some guys’ nights over in the garage. Some electrical pans have Teflon coating and some don’t. Many people like using Teflon because it makes the surface non-sticky. Others don’t like it because it could flake off into food. Either you are Teflon-friendly or not, just know that there are both options. The dimensions of electrical skillets could vary from 6 to 18 inches. These big ones are very useful if you plan to cook big meals or to cook different dishes at the same time. Most of them are about 3 inches deep. 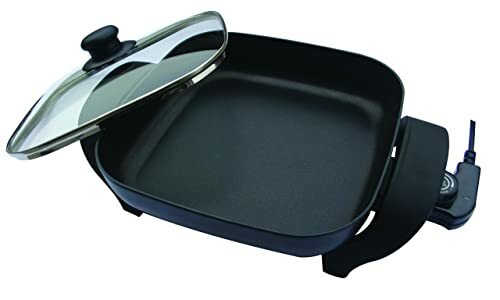 The most common shapes of electrical skillets are oval and square. I would say that both are equally good. The majority of pans are dishwasher safe which is great if you use a dishwasher. I have truly good neighbors. There are four families that my hubby and I really like to spend time with. We all are adorers of outdoor cooking. A while ago, my girlfriends and I discovered electrical skillets. Soon after, we made a deal. Every of us would buy a different electrical skillet because we wanted to test them. Eventually, we did just that. That’s how I got the opportunity to become familiar to all of them. In what follows you can find my observations. 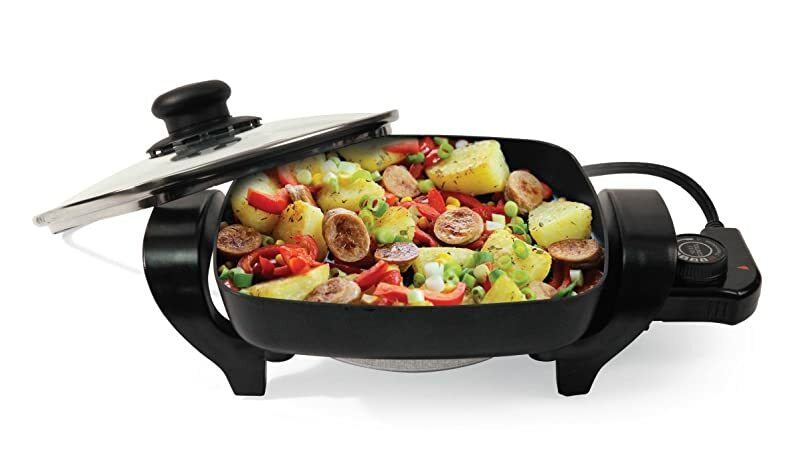 The best feature about Presto 06857 16-inch Electric Foldaway Skillet is its multi-functionality: it roasts, fries, grills, stews and bakes. And it does all of that pretty good because it has the heat control which maintains desired temperature automatically. My experience tells that there is no danger of burning up. However, although it possesses a non-sticky surface, you should be careful and use a small amount of oil or butter. With dimensions of 20 x 12.5 x 8 inches, you can cook in it almost everything you wish. Besides preparing some great food, it can be used as a buffet server as well. My friends and I use it that way all the time. It is the great feature because you don't need an additional dish. That is allowed by stay-cool handles so you can carry it very easily. Another great thing about this electrical skillet is that it occupies very little space. Skillet can be detached from the base and handles which can be stored inside the skillet. In some cases, non-stick coating begins to flake away from the sides. 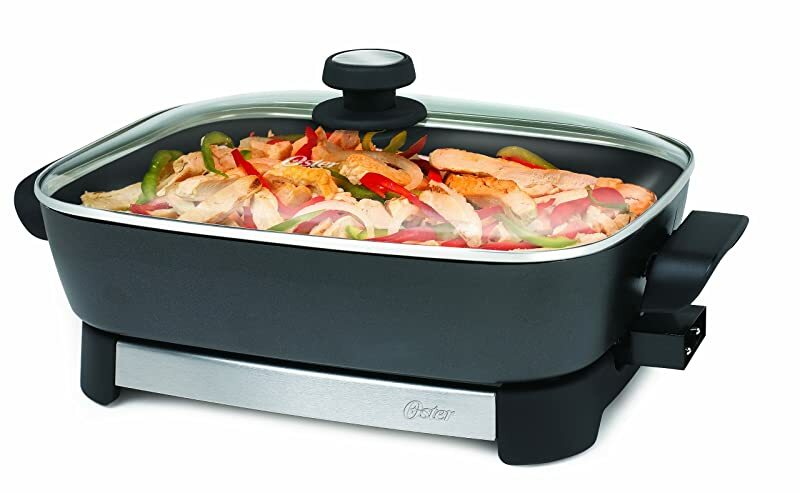 Oster CKSTSKFM05 16-Inch Electric Skillet is another multi-functional electrical pan. It is made of stainless steel which is probably the best thing about it, especially if you are not the fan of aluminum. Electrical pans made of stainless steel are considered to be more durable than other types of skillets. Although it is made of steel, it weighs 4,5 pounds. If you know that its dimensions are 19.8 x 13.4 x 6.8 inches, it should be acknowledged that this electrical skillet is really the light one. The inside of this Oster Electric Skillet is a smooth surface. It is non-sticky since the coating is made of Teflon. This will certainly be great news for those who like Teflon. Otherwise, you should pass this one. However, for those who like Teflon, you should know that it could flake off eventually. The main downside that I noticed is the fact that this pan has hot spots. You must be really careful when cooking. Another bad thing is that this pan cannot be detached out of the base and feet. This could be a problem if you don't have enough space to store it. Also, this might make things difficult if you plan to wash it in the dishwasher. It always gets stuck somewhere in the dishwasher which is pretty annoying for me. Although it is only one in many electrical skillets with Teflon coating, De'Longhi BG45 Electric Skillet is one of the most quality pans in that sense. If you use it reasonably, its Teflon coating will certainly last longer than other electrical skillets. Very interesting thing about this electrical skillet is the fact that it possesses steam vent holes on the top of the lid. You can release the steam any time you like during cooking because these vents are adjustable. However, I noticed that the lid can be loose, so steam comes out all around. That will be a problem if you plan to use steam vent holes since, in this case, they lose their practical purpose. Another useful thing that you can get with this electrical skillet is its adjustable thermostat. You can use it whenever you are not sure whether your dish is finished. This is great if you are not so experienced cook like my hubby. He uses the thermostat all the time. The problem with this electrical skillet could be its weight of 9 pounds. This is quite heavy. If you want to carry it often, then it is better to look for some other. The lid can be loose, so steam comes out all around. If you don't plan to cook a big amount of food than Nesco ES-08 Electric Skillet is ideal for you. It is perfect for singles, couples, students or travelers. Its dimensions are 10 x 12 x 6 inches, and it weighs just 3,6 pounds. In spite of its dimensions, it has enough space for roasting and frying because of its depth. My friends and I use it when we want just small snacks. Like many other electrical pans, Nesco ES-08 Electric Skillet possesses non-sticky coating. Also, it has a safety vent on the lid which is one of the best things about it. Because it is small, it resembles hot plate. But, in my opinion, it is better than it because it is safer. You can also use it for warming food especially because it is more economical than a microwave and it occupies less space. However, the biggest disappointment about this electrical pan is its dishwasher feature. Although you might find that it is dishwasher safe, it isn’t actually. In instruction book that you get with it, you can read that it is not immersible. Hence, it is not recommended to be washed in a dishwasher. Also, you might have problems with the temperature controller. When it becomes warm enough, it simply turns off and doesn't keep the constant temperature. Cuisinart CSK-150 1500-Watt Nonstick Oval Electric Skillet is another pan made of stainless steel. It has a glass lid with stainless steel rim and handles. Because of this, not only that it is quality, but it looks very nice as well. It weighs just 4 pounds. That is great considering dimensions of 13,5 x 19,8 x 6 inches. It possesses temperature control which is dialed with indicator light. The great thing about it is that it can reach up to 450 degrees. 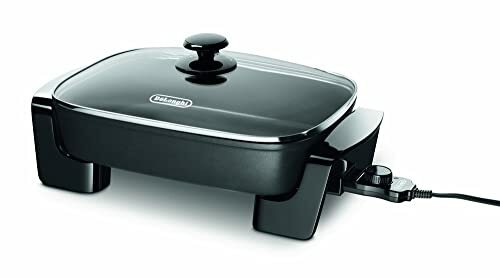 That is the highest level comparing to other skillets on our list. Also, its temperature probe can be removed which allows it to be the dishwasher safe. However, temperature control is made of plastic and eventually, it can be melted. That makes contact problems between it and the skillet which can affect its functionality. But the worst thing about this electrical skillet is that it makes annoying hum and buzz. This is really disappointing. While we were using it, we haven’t been able to talk to each other. You should notice that Cuisinart CSK-150 1500-Watt Nonstick Oval Electric Skillet is by far the most expensive skillet on this list. Generally, it is a long-lasting product. Some product owners have used it for 3-5 years. However, there are cases when some problem emerges, and it doesn't last that long. So, it is up to you to decide whether it is worth to risk that amount of money. It makes annoying hum and buzz. 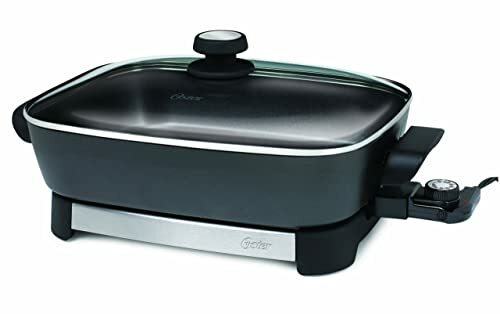 After many beautiful backyard parties with my friends and many hours of close considerations of all these electrical skillets, I find my personal favorite: Presto 06857 16-inch Electric Foldaway Skillet. It is very multi-functional and reliable and that’s what’s the most important for me. 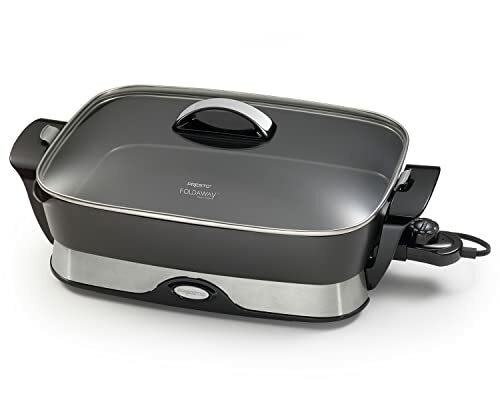 I have used it for almost everything since it can cook evenly with constant temperature. All my dishes cooked in it are as good as those that are cooked in a countertop convection oven or on a stove. And whenever we have used this pan, it was the best party. In my opinion, that’s the best possible recommendation of it. 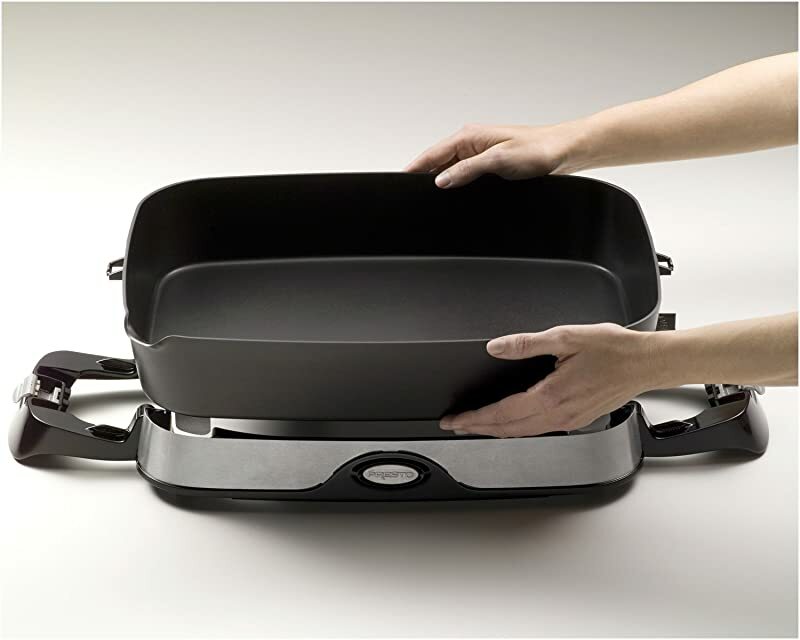 Also, its detachable elements make it extremely useful because they can be easily packed inside the pan. This feature compensates its size in the large degree. Finally, the price of this electric skillet is very affordable, and you certainly won’t be risking too much by buying it. Personally, I’m considering buying another one because I have realized that our parties are becoming more and more popular so it will be busy too.